Ken, Tom and Don having a good time, as usual. We'll all be together again soon before we leave. Yesterday afternoon we booked our flights from Nelspruit to Dublin. Of course, we opted for the flights with the shortest overall travel time which in this case was 16 hours and 40 minutes. A waterbuck at the Crocodile River. The longest portion of the flight is from Johannesburg, South Africa to Frankfurt, Germany at 10 hours and 35 minutes, an overnight flight on Lufthansa Airline. It was this portion of the flight that precipitated most of our concern. In a perfect world, we both could have sat together and flown via "business class" seated together. But, this time it was different based on our concern of my developing blood clots due to the cramped spaces in coach with little leg room and opportunity to change positions. Hippos in the Crocodile River. Subsequently, we had to make a tough decision...Tom will fly coach class and I'll fly via business class which will allow more legroom and an opportunity to sleep in a flat position as opposed to sitting straight up in the usually uncomfortable coach class seats. Female lion on the prowl. With the recent two leg surgeries on both legs, one surgery as recently as five weeks earlier, (as of May 11th, our travel date) and 90 days since the coronary bypass surgery, my flying in business class was a necessity, not construed by me as a luxury. After all these years of traveling, I have no qualms about flying coach, even on overnight flights. We've done it several times and we were no worse for the wear, other than being tired on arrival day from lack of sleep. Neither of us does well sleeping in an upright position. A parade of elephants kicking up a lot of dust in Chobe National Park in Botswana. In these circumstances, Tom may get two to three hours of sleep on the "red-eye" while in most cases, I felt lucky to sleep for an hour or so. But once we brushed our teeth in the morning, comb our hair and tidied up a bit, generally we did very well on the day of arrival. Sunset over the Crocodile River. During these periods of little to no sleep, we were surprised at how well we did the next day. In our youth, we could do this with relative ease, especially if we'd stayed up all night having a good time. Flying is not a good time, although years ago, I recall it feeling more sophisticated and pleasurable with more legroom, more decent meals served and more attention to details for the passenger's ultimate comfort, regardless of the class chosen for the flight. These knobs on the head of giraffes are ossicones. Female have hair on them. 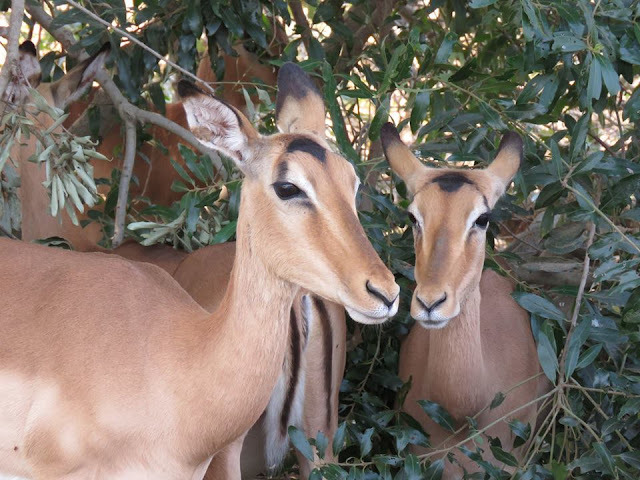 Males have lost part of the hair from headbutting when vying for dominance. Now it feels as if we're sardines in a can, swimming in greasy swill amid germs, loud talking, kids kicking the back of our seats with no parental intervention, and frustrated and overworked flight attendants trying desperately, not to "offend" anyone and to keep order in the cabin. Who knows what can break out at any moment soon to be uploaded to YouTube with millions of hits? There are two hornbills that hang around our garden each day, most likely a mating pair. When they want seeds, they sure let us know. Tom will fly coach in a row somewhere behind me and from time to time, while I'm walking hourly as required by the doctor, we'll touch base and say hello to see how the other is doing. I'll be glad when we finally get to Dublin, pick up luggage and the rental car to be on our way to the holiday rental, a several hour drive from the airport. Yesterday, we paid the final payment on the holiday home. Next, we'll book a rental car for the almost three-month stay in Connemara. I can't wait to walk in the front door of the holiday home, to see the ocean from every window, to relax once we unpack, buy some groceries and settle into our new home. At that point, we'll begin our plan to further research Tom's ancestry, one of the motivating factors in booking this period of time in Ireland. He'd hit a wall in the US using Ancestry.com, going as far back as the 1840s. It will be fun to see what we can find while in Ireland. Mongooses standing at attention while awaiting eggs. Note the little "arm" holding onto the one in front. So cute! Tomorrow, we'll return to Doc Theo when he'll re-bandage the left leg using the painful cream which last night prevented me from getting much sleep. A nap will be on the agenda today or at least an attempt at a nap, often unsuccessful. When we'd given up hope of seeing a parade of elephants, safari luck kicked in and once again, we were gifted with these elephants crossing the road. We couldn't believe the baby's determined stride! For more Kruger photos, please click here. When we had the pleasure of seeing a "blood moon" several months ago. We tossed some small chicken pieces to the mongooses and they went nuts over the treat! Note warthog, "Little's Friend," in the background trying to get in on the action. This morning at 8:45 we had an appointment with Doc Theo to remove the remaining stitches in my legs and change the dressings. Since the two surgeries on my legs over three weeks ago, I have had to have Doc Theo change the dressings and treat the incisions in a relatively sterile environment rather than doing it myself with the risks of further infection in a non-medical environment. When I got up this morning, I immediately knew something was better the moment I put my feet on the floor. The pain in my left leg, which was the most problematic of the two all along, was considerably less than it had been 48 hours earlier. Yesterday, I'd noticed a slight improvement in the pain but nothing compared to the improvement I felt this morning. I practically did a cartwheel...well, not quite. I was hopeful that once he took off the bandages, we'd see a considerable change in the appearance of the wound. 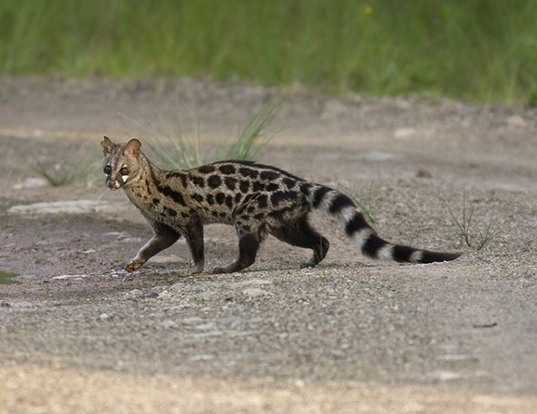 If we watch carefully at night, occasionally we'll spot a genet. We leave bits of meat out for them but often the mongoose or warthogs get to it first. Warthogs aren't carnivores, they're pigs, but they'll often eat any type of scraps. The incision in my right leg is entirely closed for the first time since the bypass surgery on February 12th and the incision on the problematic left leg looked better than it had to date. Although the left leg incision is not totally closed as yet, it looked so much better and the amount of dead tissue was substantially less. The doctor said it could be three more months until it heals entirely but at least, for the first time, there are definite signs of healing. Giraffe in our garden drinking from the cement pond. He sent one of his reception staff members to the pharmacy to get a special honey-based cream he's begun to use that will reduce the scabbing and dead skin to reveal a pinker surface which will have a better chance of healing in the long run. (Tom had dropped me off at the doctor's office and was grocery shopping when the doctor realized he needed the special cream and thus Tom wasn't able to bring it back with him). This particular cream is known to be painful once applied but once the stitches were out (a painful process) I didn't notice a thing. I was so grateful knowing I wouldn't need more surgery and that we'd be able to fly on May 11th. A proud ostrich strutting down the paved road in Marloth Park. Finally, today we'll book our flights. We've decided for me to fly via "business class" while Tom will fly economy. We've lost so much money over the past many months, we decided this was the best way to go which would save us a few thousand dollars by him flying economy. The risk of blood clots is high for recent patients of surgery, especially to the heart and legs. If I can keep my feet up for the bulk of the several flights along the way to Ireland, the risks will be reduced considerably. Male kudu lounging in the bush in our garden. Needless to say, Tom and I are thrilled to know the healing process has begun. In the interim, I can now sit in a chair which I was told to avoid after the surgery to my legs to avoid swelling. I had no idea how restrictive lying down with feet up, unable to walk other than to bathroom and back to lying down and unable to sit in a chair could be. At least now, we can eat and watch wildlife while sitting at the table on the veranda. This is exciting! Mom and tiny baby bushbuck. The pain from the coronary bypass surgery itself is all but gone except for tenderness in my chest requiring a small pillow under the seatbelt when riding in the car. Soon, before we leave Marloth Park, we'll be able to ride on the bumpy roads to search for wildlife. I'm especially looking forward to heading over to Volstruis Street (volstruis means "ostrich" in Afrikaans) which coincidentally, is where many of the park's ostriches seem to reside, to see the newest eight chicks of a proud mom and dad. Photos will follow soon. Linda, Kathy and me at one of many social events. Then, of course, I've already made a reservation for dinner at Jabula on Saturday night since I can now sit in a chair. It will be our first time out to dinner in almost a month. We certainly are ready for some lively socialization which is easy to accomplish at Jabula Lodge and Restaurant. No words can express the gratitude we feel for the endless stream of prayers and well wishes we've received from our readers, family members, and friends from all over the world. Thank you from the bottom of our hearts. May your day bring you good news! We couldn't resist sharing this mom and her baby hippo. For more photos, please click here. This is one of my top five favorite photos of one of the least desired sightings in Kruger National Park...the prolific impalas. Note the triangular head of the praying mantis as Tom took this photo yesterday when Leslie and Andrew stopped by for a visit. Tomorrow morning at our 8:45 am appointment with Doc Theo, he will decide if I need more surgery or if we can continue on with our plans. If the news is good, finally we can book the flights to Ireland and proceed with our travel plans which at that point will be in 18 days. Nothing like "down to the wire." When I recall how we always had bookings as far as two years out, I laugh at how we rarely book such distant venues in our journey any longer. Sunset from AAmazing (correct spelling for this restaurant) River View Restaurant. After this most recent medical situation, most likely we won't be booking places to see, countries to visit, more than six months in advance, other than cruises which offer great deals for booking early. After losing almost ZAR 281723, US $20,000 in necessary cancelations due to my hospitalization and recovery, we don't want to put ourselves in that position again. Also, we incurred thousands of dollars in medical expenses most likely we won't get reimbursed by the problematic insurance company. We currently have a highly experienced outside rep associated with the company working on resolving the issues with the insurance company. At this point, after everything we've done to attempt to resolve it, we're at a dead end. Either they pay or they don't. If they don't we can report them to insurance ombudsmen but even if we do so, there's no guaranty of reimbursement. Suing them is not an option. Located in the UK, the costs associated with a lawsuit against an insurance company would far exceed any monies we could be awarded. It's the way it is. Chris, Tom and black mamba at snake school. I wish I could say, we've learned a lesson...duh, don't have medical issues while living outside the USA. There was never any indication that coronary bypass surgery and its complications would have an impact on me. I still shake my head and ask, "How did this happen?" We also had no idea the insurance company would say I had a pre-existing heart condition when I wasn't aware of my clogged arteries and I disclosed at the time of the application that I take a low dose medication for hypertension which has been entirely under control for 20 years. Hypertension itself is not a cause of arteriosclerosis. View of the Crocodile River from Aamazing River View. If we'd known I had three coronary arteries 100% blocked, we never would have traveled the world. We would never even have conceived of the idea to travel the world if my health was so precarious. Who would unless they had a death wish? Good grief, we climbed the treacherous Queen's Bath in Kauai, Hawaii, walked the three hours uphill climb in the country of Jordan in 40C, 104F to see Petra? We'd never have considered these events had we known I had such a dangerous heart condition. A zebra contemplating his next move. These are all good points for a court case if it ever came to that but we know it's not possible to pursue this option, not only due to lifestyle but also due to the likelihood of an insufficient settlement. Nor, we want the negativity of a lawsuit impacting our lives. It would so much defeat the very purpose of the life we've chosen to live per our motto in our logo, "Wafting Through our Worldwide Travels with ease, joy and simplicity." There's nothing easy, joyful or simplistic about filing a lawsuit. And so, dear readers, we continue on with hope in our hearts that soon, in a matter of days, we'll be moving on to continue this dream life which we are all the more grateful for these days. Baby zebra frightened by all the commotion from the dazzle of zebras nearby. Hope you all had a wonderful Easter holiday. Be well. As mentioned in prior posts, the males are kicked out of the herd (parade) when teenagers. When we see large numbers it's unlikely any are males except for youngster yet to reach maturity at 13, 14, or 15 years of age. For more photos, please click here. An elephant in the bush watching us take photos. An adorable duiker resting in the bush. In our old lives, Easter was a big deal for our family, along with the spiritual significance of this special holiday. On Saturday, we'd attend church in the little town of Victoria where we were members for many years. We'd leave Sunday for the festivities with our kids and grandkids. I'd be lying if I said I don't miss the fun times we all had together; the filled and decorated Easter baskets for each family member and their pets; the monstrous bunny rabbit cake (Tammy always wanted the bunny's tail) covered in fluffy frosting and coconut; the games we played to find the plastic eggs with varying amounts of money in them (Greg always won the most); the Easter Egg hunt for the little ones and of course, the incessant laughter. A tower of giraffes crossing the paved road in Kruger. As the years passed and our kids had kids of their own and often "the other side of the family" to also spend time with, we spent the morning and early afternoon together, enjoying a great brunch I'd prepared ahead of time to avoid being rushed during all the fun events. A parade of elephants on the move. After they left, Tom and I did the dishes, tidied the house and put everything back in its place. For Easter dinner, we often ate brunch leftovers, just the two of us. It was a good day. Now, we don't engage in any of these activities, other than today, Tom baked a loaf of homemade coconut banana bread and made one of my low carb favorites, almond flour coffee cake, not made with coffee but with many wonderful low carb ingredients. Tonight, our dinner will be a repeat of last night dinner of Low Carb Costco Copycat Stuffed Chicken loaves, a favorite of both of us. With a side salad and pile of fresh green beans, we're content. Tonight, after dinner we'll watch a few of our favorite TV shows: Billions, Ray Donovan and Homeland since today we're signing up with Showtime for a few months. We do this a few times each year with various streaming services, watching the shows we love until we've completed the season's series. Elephants playing in the water. Then, we cancel the first service and move on to another. Once we're done with Showtime, we'll switch to HBO for a month to watch the remaining episodes of Game of Thrones. It's not possible to watch certain streaming services outside of the US, UK or Australia, etc. Thus, we use a VPN, virtual private network, that we can set to the country in which the shows are being broadcast and we avoid the message that says, "You cannot view this show outside of US (for example). Whenever one is attempting to stream, the service picks up the country in which you're currently residing. By using the VPN, we can set it to appear we're steaming from the appropriate country. Recently, we switched from HotSpot Shield to Express VPN which provides us with more options although it's more expensive. Hotspot Shield was ZAR 422, US $29.95 a year and Express VPN is ZAR 1392, US $99 a year. Some may consider this a huge expense but since we don't pay for cable, WiFi or TV services, we find it is worthwhile. Also, for example, we'll pay for Showtime at ZAR 154, US $10.99 a month. We had to wait quite a while for this elephant to move to continue on down the road. We continue to use Graboid, at ZAR 280, US $19.95 a month, a service from which we can download shows and we've used since the onset of our travels. Our maximum total monthly expense including the VPN which also adds another layer of security is ZAR 436, US $30.99 plus, the expenses for paying for any special shows we can't get at any of these streaming services. In our old lives, almost seven years ago, our month cable bill was ZAR 3303, US $235. We don't flinch at the ZAR 436, US $30.99, comparatively. The size of an elephant's foot is astounding. We never turn on the TV at any of the holiday homes we rent, during the day or evening. We find watching a few shows at night on my laptop which is relaxing and enjoyable, especially lately as I convalesce from surgery while requires me to keep my feet up around the clock. If I wasn't having to be off my feet we'd be dining on the veranda, often staying outdoors to watch and feed the wildlife until 2100 hours, 9:00 pm, then going indoors to watch one or two favorite shows on my laptop. A tower of giraffes in the bush in Kruger. Of course, we have a few nights each week when we're socializing with friends, which came to an abrupt end when I could no longer sit in a chair. It's been almost three weeks without much socializing other than dear friends who've stopped by for a visit as was the case this morning, a delightfully pleasant surprise. In a few weeks, Kathy and Don and Linda and Ken will be back, close to the time we're supposed to fly away. Fun activities and gatherings are already planned during that last week, health providing. Regardless of how you spent your Easter Sunday, we wish you the very best. Thanks for sharing it with us! Can you imagine having this photo op? 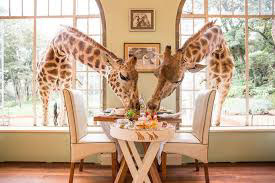 (Photo was taken at Giraffe Manor in Kenya). It was one year ago today, we booked the exciting tour to Kenya which included a visit to Giraffe Manor. Unfortunately, we had to cancel due to my heart surgery. Perhaps someday?? For more photos of what we missed, please click here. Mongooses on the veranda looking for eggs. Wildebeest males have blondish hair on their heads until they are fully mature. This keeps the older males from fighting with them for dominance as they assume they are females who permanently have blondish hair. Nature is amazing! 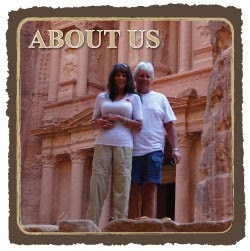 Over the years of our world travel, we've encountered many couples who are curious about our lifestyle. On occasion, we've met a few couples who have sold everything they own but often they have storage, only travel for a year or two or have an apartment or home somewhere in the world for when they decide to call it quits. Female lion checking out her surroundings. Our example of having no home, no apartment, no storage, no cars and traveling for many years is somewhat unusual but is becoming less so over the next few years as more and more people find ways to retire early or as seniors in good health, take the plunge and go for it. We met a lovely couple, LeaAnn and Chuck, while on a 24-night cruise embarking from Sydney, Australia, heading to Seattle, Washington who were thinking about traveling when retiring this year but hadn't at that time, begun the laborious process of changing and unloading everything in their lives. Two female lions far across the Crocodile River. In the past few days, they've taken off to begin their world journey having spent the past year in preparation for this unusual lifestyle. They are our ages and like us, worked until retirement allowed for this substantial change of lifestyle. Mom and baby zebras in the bush. Over the past year, we've spoken to LeaAnn and Chuck a few times on Skype answering questions and sharing some of the issues we've encountered along the way. There's been a steady stream of email messages and of course, well wishes from them as of late. One of the most frequently asked questions future travelers have asked, "What happens if one of you becomes ill? Without a home, how do you manage?" Oddly, most recently with the necessity of me have coronary bypass surgery in a foreign country, we've experienced this first hand and in the future, we'll be able to describe exactly how we handled this trying situation. When we don't have the birdfeeder up, due to the Vervet monkeys, the hornbills squawk at us until we give them seeds. They often sit atop the door frame or peck at the glass on the window. In this post of May 10, 2017, we'd met another couple, Sue and Scott, also close to our ages, who'd also embarked on such a journey, leaving most of which they owned behind. We haven't heard from them lately but wonder how they are doing and if they're still traveling. We've met and communicated with dozens of other couples on a mission of seeing the world in a variety of ways. Oftentimes, people discover after a year or two that this life isn't for them for the long haul and they find a home or apartment at a location that particularly appeals to them, often close to family and friends. This would be the norm, not the exception. A zebra determined to get our attention for pellets. If anything would have stopped us from traveling, it would have been my current medical issues but as each day passes, we feel more and more confident that we'll be able to continue on. After all, I only have a wound on my left leg that needs to heal and surely over the next few months, while we're in Ireland, it will heal with diligent and continued care. Gee...sorry, I wasn't going to mention my health this weekend but it seemed relevant to today's topic and many other topics we discuss. So, now, as LeaAnn and Chuck begin their journey, we wish them the very best as we celebrate with them, their courage and their resilience and the bravery required to begin such a life of non-stop world travel. Mom and baby duiker. Duikers usually weigh around 16 kg, 35 pounds. The steenbok which we have yet to see in Marloth Park but have in Kruger are slightly smaller. It's been such a joy to share this with the two of them and with the many others whom we've met along the way, who've written to us and many who have stayed in touch with us via Facebook as to where they are at any given moment. How fun it is for us to see them visiting places we've been or places we've yet to see. Three weeks from today, we're hoping to leave South Africa to head to Ireland, our next stop in our travels. We've yet to book our flight (many options still available) until we are assured I won't need more surgery on my leg. Enjoy your Easter holiday weekend! We call him "Little Daddy." He's about 30% smaller than Big Daddy. There are two types of kudus in Marloth Park, the Greater Kudu and the Lesser Kudu which is smaller with smaller antlers. This appears to be a Lesser Kudu. For more photos, please click here. Where would we be today, if...?